$ play help _ _ _ __ | | __ _ _ _| | | '_ \| |/ _' | || |_| | __/|_|\____|\__ (_) |_| |__/ play! 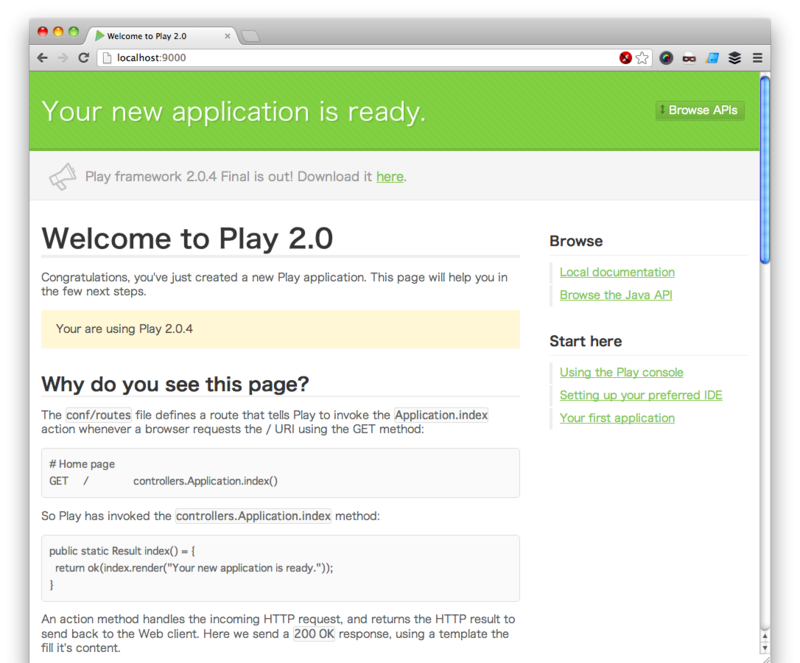 2.0.4, http://www.playframework.org Welcome to Play 2.0! These commands are available: ----------------------------- license Display licensing informations. new [directory] Create a new Play application in the specified directory. 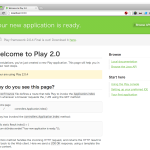 You can also browse the complete documentation at http://www.playframework.org. OK, application twowatter is created. $ play new twowatter _ _ _ __ | | __ _ _ _| | | '_ \| |/ _' | || |_| | __/|_|\____|\__ (_) |_| |__/ play! 2.0.4, http://www.playframework.org The new application will be created in /Users/baba/Documents/project/twowatter What is the application name? > twowatter Which template do you want to use for this new application? 1 - Create a simple Scala application 2 - Create a simple Java application 3 - Create an empty project > 2 OK, application twowatter is created. Have fun!